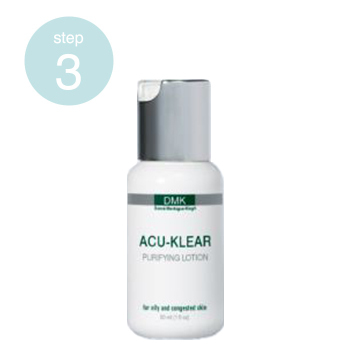 Designed to dry up existing acne and prevent future breakouts, Acu-Klear is an important step in the Acu-System routine. By applying a thin layer of Acu-Klear after cleansing with Acu-Klenz, this treatment can be applied to acne-affected areas both morning and night. Please Note: Danne Montague-King do not authorise the sale of DMK products online. We recommend that you visit your nearest DMK clinic and have the appropriate DMK products prescribed specifically to suit your skin. The products displayed on our website are to show what products are available and are not for online sale. If you wish to purchase these products please find your nearest clinic with the Danne Montague King clinic locator.